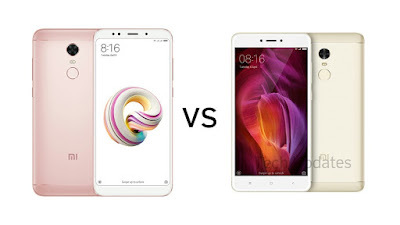 Xiaomi Redmi Note 5 vs Xiaomi Redmi Note 4 : Is it worth upgrading? Xiaomi has launched Redmi Note 5 in India with Snapdragon 625 processor, 4000mAh Battery. Xiaomi Redmi Note 4 also comes with Similar Specs. Check out Price, Specs, Features comparison difference between Xiaomi Redmi Note 5 and Xiaomi Redmi Note 4. Both Phones comes with a metal body and Fingerprint Scanner on the Rear. Redmi Note 5 has 18:9 Display whereas Redmi Note 4 has 16:9 Display Both phones are powered by Octa-Core Snapdragon 625 processor and has a 5MP front-facing camera. Xiaomi Redmi Note 5 comes in Black, Gold, Rose Gold and Lake Blue color priced at Rs. 9999 for the 3GB RAM with 32GB storage version and the 4GB RAM with 64GB storage version costs Rs. 11,999. Xiaomi is also bundling a clear case in the box. 4GB RAM model Note 4 now cost Rs 10,999. Xiaomi Redmi Note 5 comes with same specs as Note 4 difference is FullView Display, Gorilla Glass protection, Improved Rear Camera. if you own Redmi Note 4 then it's not worth upgrading. If you are looking for under Rs 10000 Phone then this is Good there is Also Honor 9 Lite at 11,000 with Dual Rear front camera.